Since I graduated, I’m working as an illustrator and it makes me feel so lucky and happy. I always try to have a positive and funny vision about life and to get a smile from who is looking at my drawings or reading my stories is what I like the most about illustration. 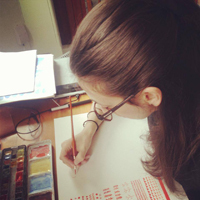 To learn more about Marta, you can visit her website: martaltes.com. You can also follow her on her Blog, Facebook Page, and Twitter. This is one of those very difficult questions… It’s very difficult to respond… I don’t remember particular books that influenced my work. I’m one hundred per cent sure that all the books you read, like all the movies you watch, or all the activities you do when you are a kid, have an influence on your work. I used to read a lot when I was little. My mum was a teacher, and she would bring home lots of books. I also LOVED comic books. On the weekends, we would go to get the newspapers for my parents, and my little brother and I would get a small comic book. The idea for my first book NO!, came from missing my dog… I had just moved to UK, and I missed him very much. I took him from the dog’s pound 3 years before, and he seemed not to mature at all… He was sooo naughty! He is 5 years old now, and he keeps being as “helpful” as he used to be. When I started this story, I wanted for it to be about a dog that stops being naughty, and his owner worrying about that… That led me to start thinking about his point of view. And that changed everything! I thought that maybe he was doing all of that cause he wanted to help out! And that ended up being the idea of my book. I do!! My parents have appeared in different drawings I’ve done. For example in this chapter book I did. Marta’s Family illustrated in one of her books. Well, yes, I think daily routines are very important, but my life has been so changing in the last couple of years, and so have my daily routines. I’ve lived in many different places, and depending on the place, my routine has changed. What hasn’t changed as you say is the caffeine! Wherever I lived I used to work from home, in my room, but this Monday I’m starting a new experience! I’ll be working from a little shared Studio. I can’t wait! Working from home can be a little bit lonely, plus I’m very unorganized, that’s why I absolutely love working from cafes (where I am right now). It makes you plan your day better, and it always helps if you are stuck with one idea to change space. Long reply alert! Ok… Everything started 4 years ago. I was a graphic designer, but something inside me made me make the decision of quitting everything and to give my dream a chance. I left the graphic design studio where I used to work, I asked for a loan to the bank, and I joined an MA in Children’s Books Illustration in England. Best decision ever! It changed my life. I worked VERY, VERY hard during the course. One of the first projects I did, was my book NO!. I went to the Bologna Book Fair with my classmates, and I showed the book to many publishers. Many people liked it, but nothing else happened. After Bologna, I kept sending a pdf version of my book to different publishers, and Martin Salisbury (the director of the MA) also sent a few of them. After a few months, Child’s Play International (UK) contacted me back saying that they wanted to publish it!!! I was over the moon! I still now cannot believe it! I’m SO grateful to them! They gave me my very first chance. That was before finishing the MA. When we did finish the MA, we did an exhibition in London, and Macmillan Children’s Books contacted me. They’ve been my publisher ever since. I couldn’t be any happier. My third book with them is coming out in June 2014! It will be called “My New Home”. Thank you very much, Marta! We can’t wait to see your new book! I love this series! Lovely interview with Marta – only left wondering if she has a dog where she is now! LOVE LOVE LOVE!!!! the pencil shavings art. AMAZING!! It’s always encouraging to hear of someone fulfilling a dream! Marta’s work is so fun – imaginative. Thanks for sharing. It is! Thank you for the visit, Mary! Thanks for the mini interview with Marta Altes. I like her simple line work where she’s also showing emotion in the way she’s drawn the object(s).